Representative Avery Bourne (R-Raymond) is joining her fellow House Republicans in an appeal to Speaker Madigan and his House Majority to cooperate and compromise. House Republican Leader Durkin held a press conference at the Capitol calling for both parties to come to the table to resolve the ongoing budget stalemate. At the press conference, Republicans pointed out that the Legislature is entering the second half of the scheduled session for this year. Despite Republican efforts to move solutions forward, there has been little progress. 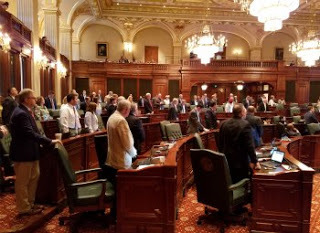 Just two weeks ago, a number of House Republican Members held a press conference calling on the Legislature to begin the work of addressing the issue of property tax relief, a crippling issue for many families in Illinois. Since then, they’ve seen and heard nothing from the majority party. The following day, another group of House Republican Members called for redistricting reform. Not only an extremely popular issue among Illinois residents but one that will help restore accountability among some elected officials and their constituents. Since then, they’ve seen and heard nothing from the majority party. “Two Senate Democrat leaders stated that a budget won’t be passed until after the Governor’s election. Does that mean they have thrown in the towel? Or, that they would rather let the state sink further to discredit Governor Rauner and keep him from winning the election in 2018?” questioned Leader Durkin at Tuesday’s press conference. Regardless of the Democratic Legislators’ intentions to pass or not pass a bill, House Republicans stand ready to negotiate, compromise, and offer solutions rather than kicking the can further down the road.